Welcome to my web page. It's called "Simon's ELT Golem" after the original Golem, a creature created in old Prague by Rabbi Loew as a labour-saving device to help his people in hard times. I'm a teacher of English in the Czech Republic and I want this to be a modern equivalent to help busy teachers of English by acting as a gateway to sites which have something interesting to offer on the chaotic world of the Web. I have also now added some reviews and plan to add articles and a selection of teaching materials one of these days. I've visited all the sites listed here and I believe that all of them have something of interest. I have deliberately not included any sites which require payment - they are all free. I would greatly welcome any feedback or comments and, particularly, recommendations for gems to add to the list. Also, URLs can change quickly, so please do tell me if you find that any of these have changed or "died". I plan to update this page regularly and to add new things to it, so why not bookmark it and drop in from time to time? 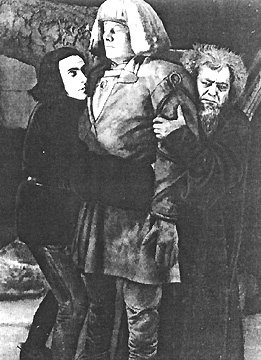 The original Golem, as depicted in a classic silent movie. The links are now on separate pages and are sorted according to categories. Just click on the links below to go to whichever pages you are after and then follow the lists, which are now in the process of being updated and alphabetised, to find what interests you.